Most of us know about the English Reformation from the writings of those who triumphed, the Protestants. But to understand the English Reformation fully, we must also ask, what was it like to be a Catholic during this time of religious turmoil? The question becomes more important because recent scholars of the English Reformation have argued that the English Catholic church was not as corrupt—nor the Protestant Reformation as pure-as many people believe. To gain a broader grasp of this turbulent time, Christian History invited Catholic historian Dennis Martin, a Wheaton College graduate who teaches medieval and Reformation history at Loyola University in Chicago, to offer a Catholic perspective on the English Reformation. No one had ever questioned the piety, learning, and spiritual vitality of the Carthusians and the Bridgettines. Their monastic houses were frequented by devout lay people for prayer and spiritual growth. In fact, Archbishop Thomas Cranmer, who knew two of the victims personally, opposed the executions, but only because he hoped the monks could eventually be convinced to recognize the king as head of the church. And that gives us a clue as to what many recent historians think is the real nature of the English Reformation. The conventional story of the English Reformation has been told by Protestants. It begins by describing the Catholic church as moribund and lacking popular support. Protestants triumphed over a decadent church that was in collusion with power-hungry political rulers. The incident above, and others like it, suggests another story. Unfortunately, many historians have overlooked a significant fact: the Church of England’s victory over the Pope was possible only because the king and Parliament seized absolute control of English religion. Henry grabbed the power of the church for himself, and his regime systematically destroyed the symbols, institutions, and customs that had sanctified English daily life for a thousand years. For instance, facing widespread defiance of royal efforts to eliminate veneration of the saints, in 1538 Vicar General Thomas Cromwell staged an elaborate set of demonstrations rigged to “prove” that miracles associated with images of saints were hoaxes. Cromwell and Henry made sure the Bible was made available to the English people. But they soon became alarmed that, instead of leading to “meekness” among his subjects, Bible reading fostered arguments in taverns, churches, and ale houses. So in April 1539, Henry drafted a degree that forbade anyone but licensed graduates of universities and parish priests to expound the Scriptures. Nowhere is this absolutism clearer than in the decree of March 1551 that “for as much as the King’s Majestie had neede presently of a mass of money,” all the remaining precious metal and valuable church furnishings were taken by the government. Such church furnishings belonged to the parish, and they were cherished by descendants of the donors. This decree from on high struck at the heart of local religion and history. So it’s not surprising that with his Act of Supremacy in 1534, Henry intended to keep England’s religious practices largely as they were: Catholic. All he wanted to do was to change who was in charge of the church. Most elite members of society knuckled under or maintained silence, although even silence, as the case of Thomas More illustrates, could be costly. 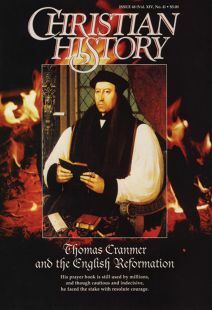 Archbishop Cranmer, though cautious throughout the 1530s, tried to attack firmly Catholic religious practices. Other Protestants were less patient. Hugh Latimer did not stop at railing against Catholic “image-worship.” He presided in May 1538 over a “jolly muster,” as a traditional-minded friar, John Forest, was roasted alive over a fire made of a wooden statue of a saint hauled out of a pilgrimage church. King Henry became alarmed at such anarchic iconoclasm and tried to apply the brakes from 1539 to 1547, but it was too late. The king had set in motion changes in 1534, and these changes made possible the success of the all-out assault on traditional religious practice under Edward (1547–1553). Still, during Henry’s and Edward’s reigns, support for Catholic religious practice remained strong, as popular rebellions in 1536, 1548, 1549, and 1554 show. But even after the Elizabethan settlement, when Protestantism ruled the nation uncontested, traditional Catholicism remained deeply embedded in all classes. Nowhere is the strength of lay devotion more evident than in the story of Margaret Clitherow. Born about 1553 in a leading Protestant family of York, Margaret married a wealthy tradesman, John Clitherow, in 1571. Three years later, she became a Roman Catholic, although her husband remained Protestant. In March 1586, when she was in her early thirties, she was arrested for harboring Catholic priests. She refused to plead guilty or innocent, lest her children and husband be compelled to testify against her. The penalty for refusing to plead was to be crushed to death under nearly half a ton of weights. Even her Protestant neighbors respected her and refused to testify against her. Margaret was convinced that a mere change at the top, such as Henry VIII envisioned and Elizabeth was establishing with finality, actually constituted a massive betrayal of Christ’s Church. On Annunciation Day (March 25) 1586, as the weights crashed down on the heavy oak door that covered her, as her ribs could be heard to crack, Margaret said, “Jesus! Jesus! Jesus! Have mercy on me.” Her body was left under the door and weights from 9 a.m. to 3 p.m., then stuffed secretly in a rubbish heap.